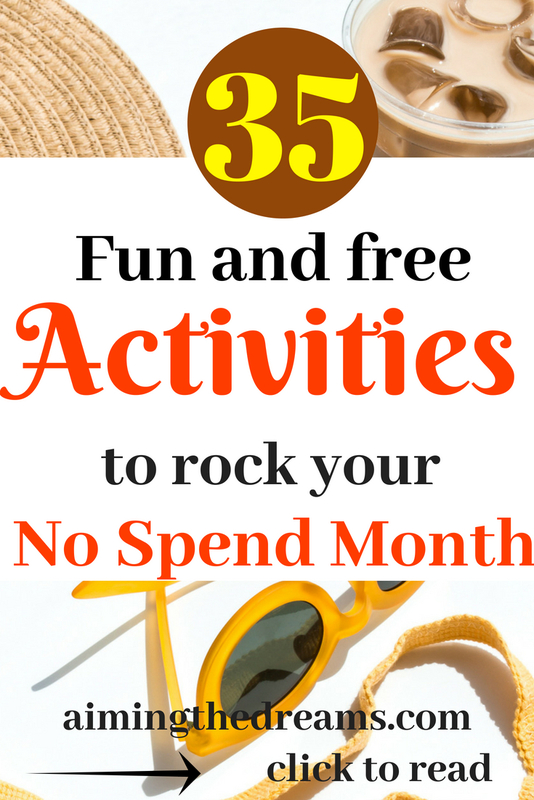 These fun activities to do in a no spend month will help to make it successful . How is your savings plan going on ? Hope you are enjoying saving money. Growing your savings account gives tremendous happiness. Activities to save money saves you really good amount of money. Just keep a check on your spending habits. No Spend Month bolster your savings and helps in controlling your spending habits. Along with side hustles to have extra money, controlling your spending, helps in growing your account. It is best to save when you have income, for the hard times. I am not a frugal person when I have money. I can’t do anything when I don’t have it though. But cutting your spending now and then is a great way to save some money and make your savings grow. All of us enjoy entertaining activities in life but if you are trying to save money then you have to curb your spending urges. 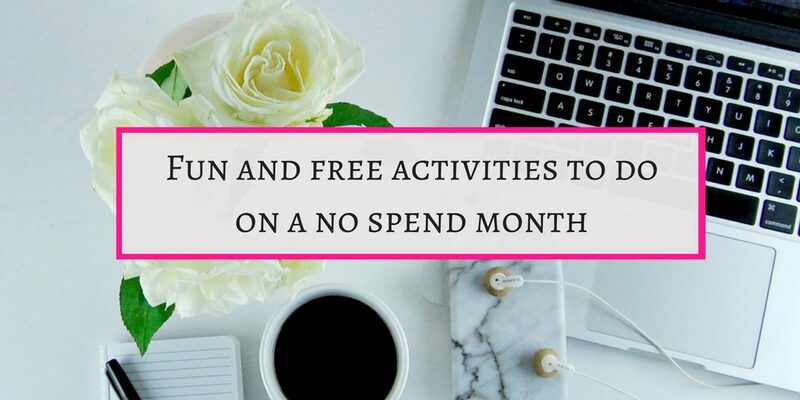 During your no spend month, you have to be be creative with your imagination to find free activities to entertain yourself and your family. For making your No spend month a success, you really have to plan it ahead. Planning for the meals, milk any other thing is a better option. Planning also constitutes the leisure activities. As you are on a no spend month , you really have to be creative with everything. It is easy to plan everything if you are the only one at home, but becomes little complicated with kids and other family members. 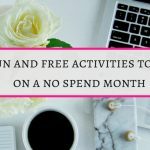 Write down the free activities you can carry out during your no spend month. This list should be according to the tastes of your family members. Plan the activities which everyone in your family can enjoy. Especially during the weekends, the urge to entertain your self will be strong. This is the best free activity you can do daily. The only thing is you should have a park near you. Which I think most of areas have. If it is bit far, better because you can walk more. This will give a boost to your health. My favorite entertaining activity is going to my nearby shopping center. But if I have planned for a month to be a No spend month, I just go for a walk to nearby park. It is 10 minutes walk but I love it. We have an open area near our house and I get to see lot of Kangaroos there. It gives a beautiful sight. Walking around your surroundings will give you insights on what you are missing. In today’s fast paced and digital world, surroundings are often overlooked. Have you noticed the beautiful flowers in front of the houses in your street? If not , just go out and walk around your neighborhood. Read that book which you borrowed or bought but never got time to read. Reading books give you plethora of knowledge. Invest sometime in reading the books which you already have or borrow from library. Stay away from spending money. Curb the urge to spend any money. Put all the money in savings. Otherwise you will spend that money next month when your no spend month will be over. This is free activity which most people miss because they have so many things to do. Going at spiritual place will give you peace of mind. Moreover, you can socialize there with other people. Indoor games like chess, hide and seek inside house, sitting together and everybody singing one or two lines of songs, will make a beautiful activity. As human, we all have the tendencies to collect things and keep them piled. Some times we even forget about what we have in our cupboards. Utilize your this time to de-clutter your home and sell those things which you don’t need. Sometimes you can make good money with old things. Or you can donate those things. If you small kids at home, play with them. Kids love to play with parents, why not give your time to kids. You will find your energy levels so high. And kids really teach u to be enthusiastic about small things in life. Changing settings of furniture at home is a fun activity. Do it even if you don’t like it. You will be surprised at your happiness after rearrangement of furniture. Your house will have a new look without spending even a dime. I have made greetings with my nephew. He is always ready to make greetings at every occasion. Now this is my favorite free activities. I just make greetings with whatever I have at home. It is so refreshing and satisfying. Discover a new recipe and make a new dish. And please keep in mind, you have to taste it first and you my have to eat it alone ( haha) after tasting. Believe me, you will feel proud on your invention. There are so many places which need your time for help. Go there and volunteer for good cause. Best places to volunteer are libraries, retirement homes, Red cross, Animal shelters, Hospitals. These places really need some volunteers to help them. Why not make it a fun activity and utilize your time for a cause. Because you are on a no spend month, you will not want to spend money on extra food. So ask your friends for a potluck. And enjoy together. Yes try to accommodate running schedule in your no spend month. Start slowly and build your stamina and then go on increasing your running time. What an awesome activity to do for free. Cycling is good in any climate except rain if you don’t like it. It is fun and healthy. Talking to long distance friends and relatives is the best thing you can do. It gives a kind of happiness I cannot explain in words. You are living a happy and healthy life but never got a chance to say thanks for your blessings. This is the time . write down all your blessings and feel great about them. As we all know, networking is a crucial step in anybody’s success. Take advantage of this time and with people. Send messages on social media or email them. Call if possible. Friend are therapeutic. They just make your life beautiful. Connect with a long lost friend. Message him/her or call. Friends from your school or college would love to hear from you. Sit in sunlight and oil your hairs. Give a good massage your self. You don’t need anybody’s help for this. You can do it your self. Take good lotion and massage on your hands and feet. Start self care care routine to pamper your self. Watch free airing movies with family. Or watch any movie from your collection. This is the most enjoying activity. You will be astonished about a writer inside you. You would love it. Don’t worry, you are writing for your own self. Nobody is going to read it if you don’t want. Just write it. It is cathartic. Go sight seeing your nearby areas and pay attention to those places you never thought exist. Watch a Youtube video on how to knit and start knitting. But the problem is you should have needles and threads at home. Don’t worry, some websites teach you how to knit on fingers. Learn knitting here at Loveknitting. Take some food with you and go to beach if weather allows. If you want to spend some time there, take home cooked food and drinks with you. You don’t have to spend money on anything. Visiting a museum is not only entertaining but educating also. If you have free museum near you , you will love it and it is good for your kids also. What a great way to enjoy your no spending month. You will earn some money also. There is no pressure to spend great deal of time on this. But you will benefit from spending your little time here and there on surveys. If you have never got time to stop and write your financial goals, then this is the time to do so. Write down your long term, mid term and short term financial goals. Have you ever tried baking bread with new recipe at home. Either look for some recipe or make your own. Take out your old albums and enjoy your old pics. Talk to your family bout them .This is really a good activity to enjoy during your no spend month. National parks are free and great places to enjoy your day for free. Just take care of your spending on food. Always remember to take food , water, juice with you. Garage is the most overlooked place. Why not organize it and clean it. I t will give you so much space to use. Sunset and sunrise are the most beautiful masterpieces of nature. Watch sunset and sunrise with your family, you would love it. Sunset makes sky so colorful and mystic that it is impossible to explain the beauty in words. Go out and watch it yourself. Libraries are great place to spend your time effectively. There are so many free books and magazines to read. Take advantage of that to save some bucks. 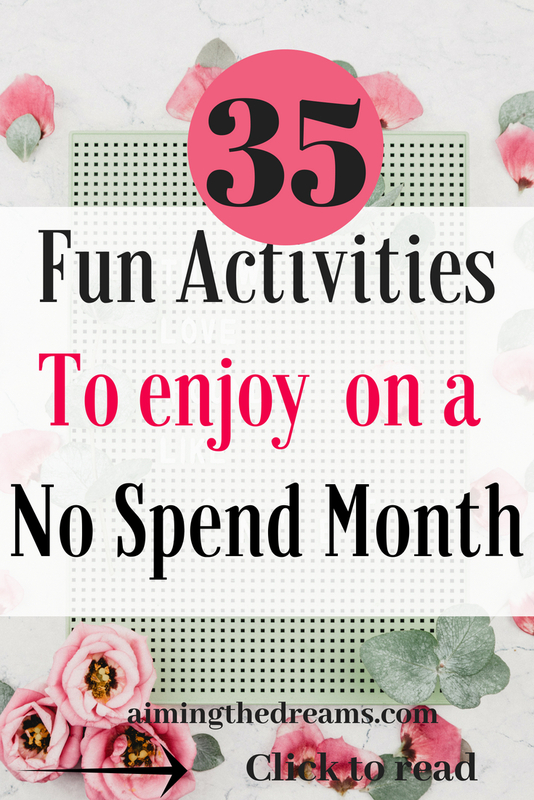 These are great activities to do in a no spend month. Please share it if you like it. And tell me in comments what do you think about the ACTIVITIES IN A NO SPEND MONTH. Love these ideas! How to live simply, like in the “olden” days. Thanks Janice for stopping by and commenting. Life was really simple earlier. Now it is all digital. Even my 2 year old just want phone and laptop whole day and I have to hide those things from her.